More than 1,000 young people took the sporting stage to compete in the South Yorkshire Sainsbury’s School Games winter finals. European and Commonwealth swimming medallist Joe Roebuck, from Rotherham, was on hand to open the annual day-long event at the English Institute of Sport Sheffield (EIS Sheffield). At an Olympic-style ceremony at EIS Sheffield, pupils took part in an athletes’ parade before watching a musical performance by Chris Badger from Aston Academy and dance displays by Horizon Community College. Former GB swimmer Joe Roebuck said: “I wish I’d had an event like this when I was at school. I would have loved to have taken part in the School Games. “I took part in every different sport at school until I started swimming. I never thought competing at the Olympics would be possible. But it doesn’t matter who you are or where you are from, you can achieve anything. Schools from Barnsley, Doncaster, Rotherham and Sheffield competed in eight sports across 22 different competitionsincluding athletics, basketball, boccia, cheerleading, gymnastics, netball, New Age Kurling and SportsAbility which also includes disability sports Sitting Volleyball and Goalball. The event included a VIP ceremony attended by the Mayor of Barnsley, Cllr Ken Richardson, and the Mayor of Rotherham, Cllr John Foden. 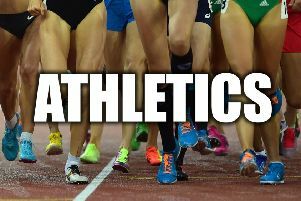 The summer multi-sport finals will be held in Rotherham on 1 July. Visit www.sysport.co.uk<http://www.sysport.co.uk>/schoolgames follow the Games on Twitter @SYSchoolGames or Like the Games at www.facebook. Boccia - Key stage 3/4: 1 Stone Hill, Doncaster; 2 Kelford II, Rotherham; 3 Kelford I, Rotherham. Key stage 2: 1 Wharncliffe II, Sheffield; 2 Heritage Park II, Sheffield; 3 Mossbrook IV, Sheffield. Foundation Gymnastics - Year 3/4: 1 Bentley High Street, Doncaster; 2 Ballifield, Sheffield; 3 Brampton Ellis, Rotherham. ADVANCED Gymnastics - Year 3/4: 1 Mundella, Sheffield; 2 Upperwood, Barnsley; 3 Bentley High Street, Doncaster. Foundation Gymnastics - Year 5/6: 1. Phillimore Park, Sheffield; 2 Malin Bridge, Sheffield; 3 Carfield, Sheffield. ADVANCED Gymnastics - Year 5/6: 1 Carfield, Sheffield; 2 Mundella, Sheffield; 3 Upperwood, Barnsley. Foundation Gymnastics - KS3: 1. Horizon, Barnsley; 2 Notre Dame, Sheffield; 3 King Ecgberts, Sheffield. Advanced Gymnastics - KS3: 1 Tapton, Sheffield; 2 King Ecgberts, Sheffield; 3 Horizon, Barnsley. Sportsability: 1. Newman, Rotherham; 2 Dearne ALC, Rotherham; 3. Seven Hills, Sheffield. Cheerleading - Key Stage 2: 1 Bramley Grange, Rotherham; 2 Mundella, Sheffield; 3 Brampton Ellis, Rotherham. Foundation Cheerleading - Key Stage 3: 1 Wickersley, Rotherham; 2 Hinde House, Sheffield; 3 Springs Academy, Sheffield. Advanced Cheerleading - Key Stage 3: 1 Wickersley, Rotherham; 2 Westfield, Sheffield; 3 Horizon, Barnsley. Foundation Cheerleading - Key Stage 4: 1 Camspmount, Doncaster; 2 Balby Carr, Doncaster; 3 Horizon, Barnsley. Advanced Cheerleading - Key Stage 4: 1 Wickersley, Rotherham; 2 Hinde House, Sheffield; 3 Maltby, Rotherham. Netball: 1 Shawlands, Barnsley; 2 Silkstone, Barnsley; 3 Wadsworth, Sheffield. 2 Marlcliffe, Sheffield; 3 St. Albans, Doncaster. Secondary school sports hall athletics - Year 7 Girls: 1 Wickersley, Rotherham; 2 King Edwards, Sheffield; 3. Winterhill, Rotherham. Year 7 boys: 1 Winterhill, Rotherham; 2 Wickersley, Rotherham; 3 Hungerhill, Doncaster. Year 8 girls: 1 Winterhill, Rotherham; 2. Wickersley, Rotherham; 3 Hungerhill, Doncaster. Year 8 boys: 1 Hinde House, Sheffield; 2. Hungerhill, Doncaster; 3 Wickersley, Rotherham.